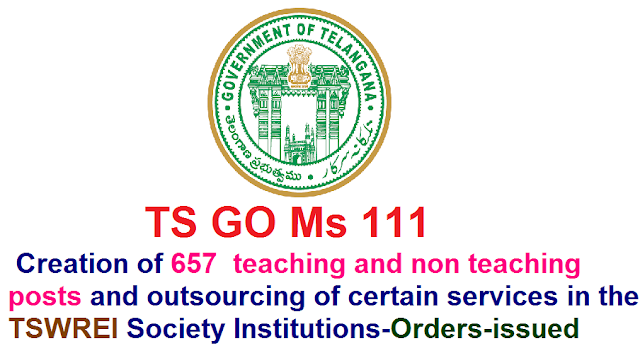 TS GO Ms 111 Creation of 657 teaching and non teaching posts and outsourcing of certain services in the TSWREI Society Institutions- Orders - Issued. Government of Telangana|Finance Department|S C Development Department|TS GO Ms 111 Creation of 657 teaching and non teaching posts and outsourcing of certain services in the TSWREI Society Institutions- Orders - Issued. S.C. Development Department - Creation of (657) Teaching and Non-teaching posts and outsourcing of certain services in the TSWREI Society Institutions- Orders - Issued. 1. G.O.Ms.No.78, SW (RS.1) Dept., Dt.13-10-2006. 3. G.O.Ms.No.10, SW (RS.2) Dept., Dt.25-01-2014. 4. S.C. Development Department, U.O.Note No.6849/SCD.RS./2012, dated.29.08.2016. In the references 1st to 3rd read above, administrative sanction was accorded, among others, to start ten (10) schools (i.e. Bellampalli(B), Manakonduru(B), Alampur(B), Chennur (G), Wardhannapet (B), Danavayigudem (G), Kulcharam (G), Gopalpet (G), Domakonda (G) and Gachibowli (G)), one (1) institution as Centre for Excellence (Karimnagar) and one Residential Sports School(G) at Raikote under the control of the Social Welfare Residential Educational Institutions Society. 2. In the reference 4th read above, the Schedule Caste Development Department have proposed for creation of certain Teaching and Non-teaching Posts for the TSWR Schools under the control of the Secretary, TSWREIS, Hyderabad. 5. The S.C. Development Department shall obtain concurrence of Finance (HRM.II) Department before initiating measures to fill up the posts sanctioned in this order, wherever service rules prescribe direct recruitment. 6. The S.C. Development Department is requested to take necessary further action in the matter accordingly.